High-end plumbing company expands its Nottingham Brass and Whittington Collection product lines, introducing new brass faucets for kitchen and bathroom sinks. Among the new designs are unique waterfall faucets, which allow water to flow over glass into a bathroom sink. 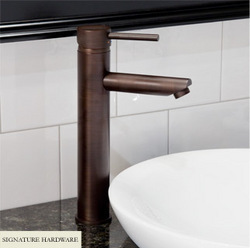 Signature Hardware has unveiled a new selection of kitchen and bathroom sink faucets, adding to an already extensive line of luxury plumbing products for the home. Made of solid brass, the new faucet styles range from shapely Victorian to angular minimalist, and include several transitional designs that can be used with any home's decor. Several traditional faucets, such as widespread lavatory faucets and kitchen faucets, have been added with the Nottingham Brass brand label. These mixers sport the graceful curves and sculpted handles that homeowners have come to love, and include features like intricately detailed levers, four ball cross handles, and gooseneck spouts. Antique reproduction kitchen faucets are available with vintage style bridge bodies and shepherd's hook spouts, making them perfect accents to farmhouse sinks. The Whittington Collection line also includes a number of new faucets, such as single hole faucets for use on lavatory basins and vanity cabinets. Sleek lines and sharp angles make these fixtures ideal for modern bathroom settings. New contemporary vessel filler faucets are available in a variety of finishes, and are made for use with above-counter basins or semi-recessed sinks. Also among the new designs are unique waterfall faucets, which allow water to flow over glass into a bathroom sink, creating a pleasing waterfall effect. Kitchen sink mixers have handy pullout sprays with adjustable flow patterns, and the single handle controls allow for one-handed use in the kitchen. In addition to a variety of sink faucets, Signature Hardware has also introduced new single hole bidet faucets to accompany vitreous china bidets. These fixtures have become increasingly popular as European style continue to influence American design, and Signature Hardware offers several bidets that are made to match popular toilets and pedestal sinks. Bidet faucets are available in finishes such as Oil Rubbed Bronze, Brushed Nickel, and Chrome to complement a homeowner's existing bathroom fixtures and accessories. These new products and more can be found on the company's expansive website, http://www.signaturehardware.com, as well as on display in their northern Kentucky showroom. The Erlanger retail location features a number of bathroom vignettes featuring the company's brass goods, vitreous china sinks, copper bathtubs and air spa tubs, as well as kitchen sets with stone farmhouse sinks, stainless steel range hoods, backsplash accent tiles, and more. Decorative door hardware, floor registers, coat hooks, outdoor furniture, and light fixtures are also on display and available for purchase. Signature Hardware is a direct merchant of antique-style reproduction fixtures for the home. Working directly with the factory and selling direct to the end consumer, they are able to provide superior service and exceptional value. The firm distributes its products nationwide, and sells direct to the consumer by the use of print catalogs, its retail showroom located in the Cincinnati area, and online.